In the latest effort to bridge its desktop and phone apps together, Microsoft yesterday made available two of its Windows 8.1 apps for Windows Phone 8.1. These apps are Reading List and Movie Moments. 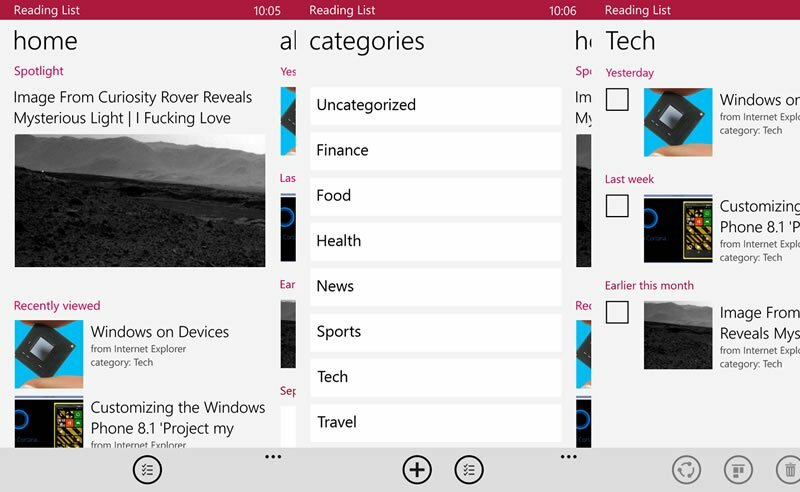 Reading List, as the name suggests, allows users to save online content like web articles, videos, and more, as well as content from other native Microsoft apps like News, for later reading or while on the go. It's Microsoft's own version of third party apps like Instapaper and Pocket that aren't are natively available for its smartphone platform. The app lets you filter and sort articles into categories, and it easily syncs between PC, tablet and phone so that you don’t lose track of your saved content. According to the software giant, the Windows Phone 8.1 app features an improved Home screen that "highlights an article from your list with a nice big version of the article’s image and under that, the Recently viewed section will show the five most recent things launched from Reading List". On the other hand, Movie Moments is a video editing app that lets you create shareable 60-second clips. Features like trimming, captions, and background music are all supported. There are sharing options to OneDrive, email, Facebook, and more. The app is pretty much similar to the full Windows 8.1 app. Both Movie Moments and Reading List are free, and are available for download on the Windows Phone Store.